We expect that all who wish to walk with Ruth on the first and last day of the pilgrimage will be experienced hikers with good walking boots. Taking part in the pilgrimage on these days will be at the personal risk of the persons who take part. Service to bless the pilgrimage involving pupils of: Bishopston Primary School, Penllergaer Primary Schools and St Teilo’s High School Cardiff. Pupils of Knelston School will join Ruth on Oxwich beach and to walk to St Illtyd’s Church for the lighting of the peace votive. Service of thanksgiving and prayers for world peace, involving representatives of several faiths. “Let there be peace throughout the universe. This year the award winning Peace Mala project for world peace is celebrating its tenth year. 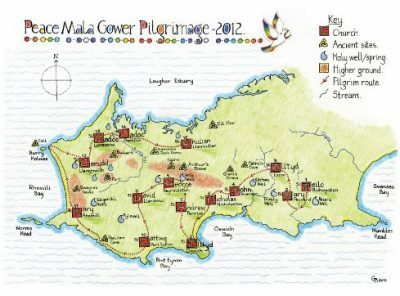 In celebration of this, a sponsored Peace Mala walking pilgrimage for world peace will be taking place around the sacred sites of Gower, including holy wells, springs, and churches. This will take five days to complete. The pilgrimage comes with the full backing of the Church in Wales and support of the Gower Deanery. 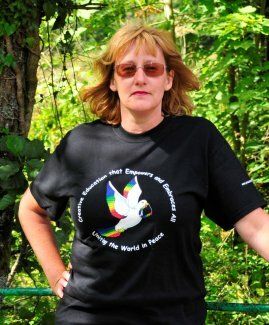 Ruth Davies, who is an experienced walker and did seven days of the Camino for Peace Mala in Easter 2009, will be our main pilgrim. Ruth will be joined on certain parts of the journey by other walkers, including children and young people. We hope that people will feel moved to sponsor Ruth’s brave effort and help us continue our work with children and the wider community as we seek to help create a more compassionate world. Approximately one month before Ruth starts the pilgrimage, we will have a celebratory meal and social evening. Once the venue has been decided we will let supporters know. 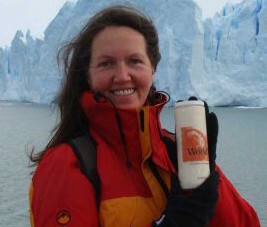 Ruth will start her walking pilgrimage on Wednesday 18th July 2012. We will meet at The Lamplighter in Bishopston (Tel: 01792 232012) at 9am and then walk with Ruth to St Teilo’s Church where the first of many votive candles for world peace will be lit. The Bishop of Swansea & Brecon will be joining us for this. Ruth plans to visit three churches on each day of the pilgrimage. Votive candles and prayers for peace will be made at each church visited. The clergy of Gower Deanery have kindly agreed to make arrangements for Ruth to have access to all the churches on the Gower pilgrimage trail. I will be meeting Ruth at the last church on each day of the pilgrimage. 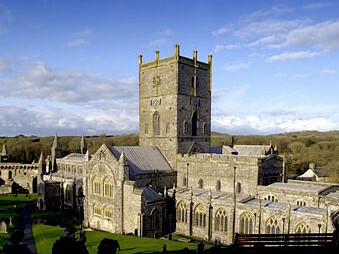 On Sunday 22nd July 2012, Ruth will start the last day of the pilgrimage from St Madoc’s Church in Llanmadoc. We invite everyone who wishes, to join Ruth for this last day of the walking pilgrimage. If you feel unable to do all of the walk on this last day, join us for part of it, or come to the thanksgiving service at the end which will take place in St Rhidian & St Illtyd’s Church in Llanrhidian. As mentioned before, please be sure to contact Ruth if you are interested in joining her for any part of the walking pilgrimage. After leaving St Madoc’s Church in Llanmadoc, Ruth will walk to St Cadoc’s Church in Cheriton, calling into The Britannia Inn on route for a short rest and refreshment. The pilgrimage will then continue towards St Rhidian & St Illtyd’s Church in Llanrhidian. Upon reaching Llanrhidian, Ruth and fellow pilgrims will be welcomed by Fr Tim Ardoin. We will invite children and young people, church members and people of other faiths to join us for a short service of thanksgiving and prayers for world peace. We hope that all can join together in the spirit of Peace Mala which promotes friendship, respect, dignity and unity between everyone who lives and breathes on our beautiful planet earth. Our joining together in this way will be powerful and profoundly joyful. We plan to arrive at St Rhidian & St Illtyd’s Church for this special service by around 4pm-ish. After the service, those who wish to can join us at The Dolphin Inn which is next to the church in Llanrhidian Village. Light for the pilgrimage is being sourced from powerful places. 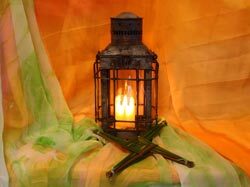 A light from The World Peace Flame based in Snowdonia will be collected during March in readiness for the pilgrimage. The World Peace Flame was created in July 1999 when seven living flames, lit by peacemakers on five continents of the world, were flown across the oceans to Snowdonia by military air forces and commercial airlines and united into one eternal Flame. The World Peace Flame is pleased to support the vision and message of the Peace Mala project. We have much in common and believe that when there is mutual support and respect, more can be achieved for the benefit of all in our world. We are especially pleased that a light from the World Peace Flame will be taken back to Peace Mala HQ in Swansea South Wales. This will be used in blessing for the beginning and ending of the Peace Mala Gower Pilgrimage for World Peace in July 2012, marking Peace Mala’s tenth year. In addition to the World Peace Flame, we will be travelling to Kildare in Ireland to collect The Light of St Brighid from the Sisters of the Brigidine Order. 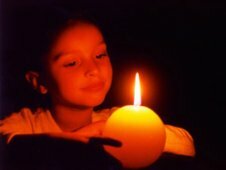 “We see the Brigid flame as a symbol of hope, justice and peace for our country and our world. 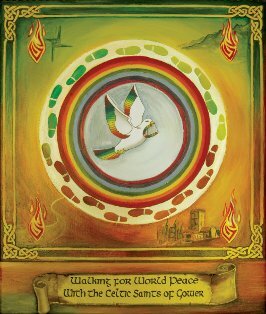 So it would be appropriate to have the St. Brigid flame as part of your peace walk. After hearing the legend of St Rhidian and his/her pilgrimage to the shrine of Saint David when light from the shrine was brought by Rhidian back to Gower, it seemed obvious to me that we needed to do this again and re-kindle awareness of the spiritual power of pilgrimage and our beloved Celtic Saints. I’m delighted to announce that the Bishop of Saint David’s and the Dean of the Cathedral are in support of this idea. A short service of blessing with the lighting of a lamp near St David’s Shrine and prayers for the success of the Gower Pilgrimage and its intent will take place at the cathedral. After the service we will carry the blessed light from the cathedral back to Peace Mala HQ in Swansea, in readiness for the Gower Pilgrimage. I am also preparing a small book on the Celtic Saints of Gower to accompany the pilgrimage. This will be illustrated by children from our local Peace Mala schools. All proceeds from the sale of this book will be donated to Peace Mala funds. Our global family of schools, youth groups and community groups continues to grow in exciting ways that bring new hope to communities across Wales, the UK and countries beyond us.